This foot sleeve is the ultimate solution for stiff, weak, sprained or injured ankles. If you want to recover faster and minimize pain, discomfort or swelling, then Blitzu foot compression is the best product for you! RELIEVE THE PAIN: Help to relieve pain & discomfort in your foot. Best treatment for plantar fasciitis, achilles tendon, stress fracture, swelling, heel and ankle pain symptoms. AVOID INJURY: Prevent unnecessary injury and pain by offering optimal muscle support during everyday activities. SPEED UP RECOVERY: Improve blood circulation. The compression helps relieve foot pain as well as aids in muscle recovery & rehabilitation. WARMING EFFECT: Support full motion flexibility and Warm up your feet effectively. COMFORTABLE: Ergonomically designed for full range of motion and superior comfort. Your satisfaction is our guarantee! If you aren't happy with your purchase for any reason, let us know and we'll refund your money back or send you a replacement! That is how confident we are that you will LOVE your compression socks. Don't Wait. Click on the Add to Cart button, and have your Blitzu Foot Sleeves shipped today! ✔ COMPRESSION THERAPY TECHNOLOGY - INSTANT PAIN RELIEF from Plantar Fasciitis & Fibroma! These braces provide the perfect amount of Plantar Fascia Support to stop the pain in the Foot, Heel, Ankles, Joints, Tendons, & Muscles. It also improves circulation, reducing inflammation and expediting the plantar Fasciitis healing process. #1 RECOMMENDED Therapy Socks! 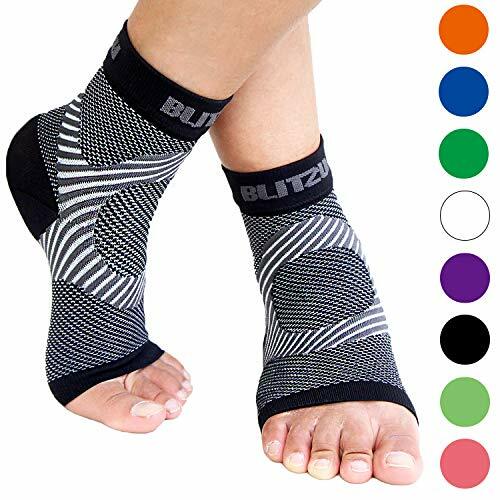 ✔ BLITZU KINESIOLOGY TAPING DESIGN - The One-of-a-Kind compression socks that combine the stability of kinesiology taping with the performance of compression fabric. This Unique Design Aligns With The Fascial Meridians To Provide Nerve, Muscle, Ball, Reflexology, Tendonitis, Flat Feet, Massage, & Stretch Therapy. It also provides extra compression and support, which are both important for times when you are active and helps you prevent new injuries. ✔ PROFESSIONAL HIGH GRADE QUALITY - Made of Power+ Premium Performance Fabric - Durable, Breathable & Moisture Wicking and will stay dry even during the toughest workouts. A must have for men, women and elder at any age. Stay put Cuffs & Soothing feeling at the bottom and sides of foot, with no pinching. Sleek, stylish, fashionable design with many colors available. ✔ DESIGNED FOR EVERYDAY USE AND OUTDOOR ACTIVITIES - Bring more energy into your feet! This amazing Foot Sleeves provide all day relief, limiting Plantar Fasciitis foot and heel aches. Premium Open Toe Splint Design Enables You To Wear Alone Or Under Another Sock Without Feeling Too Thick. Our ankle sleeves are comfortable enough to wear All Day, All Night, and While Sleeping. It can be worn With Shoes, Sneakers, Sandals, Flip Flops, Or Slippers. Better Than Using Pads, Orthotics, & Insoles! ✔ BUY IT NOW AND FEEL THE DIFFERENCE INSTANTLY - 100% SATISFACTION GUARANTEE- Your satisfaction is our guarantee! We Promise These Are The Most Perfect Fitting, Maximum Swelling Reducing, Highest Pain Relieving, Longest Lasting Compression Foot Sleeves You Will Ever Own. If you don't absolutely love your foot sleeves for any reason, let us know and we'll refund your money back or send you a replacement! That is how confident we are that you will LOVE it! DON'T WAIT, ADD TO THE CART NOW! If you have any questions about this product by BLITZU, contact us by completing and submitting the form below. If you are looking for a specif part number, please include it with your message.